I’ve already blogged about my first experience to Good Catch Boil House when I went there for their media tasting about a month ago (time flies!). Recently, I visited Good Catch Boil House again two more times because I had two gift certificates that I wanted to use up before they expired. Also, I love seafood so it was worth it to come again to try it out as a true customer and not as a guest as part of a media tasting. 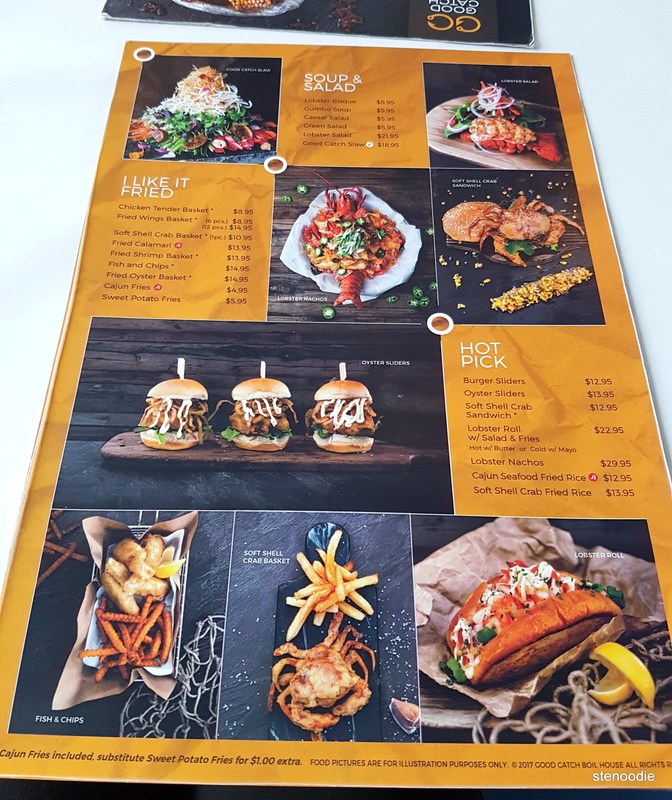 Although Good Catch Boil House opened in January, it was a soft opening and it was only during this past weekend (April 8) that they had their grand opening. Up until then, the restaurant was open but it was still in “practice mode”, I guess. 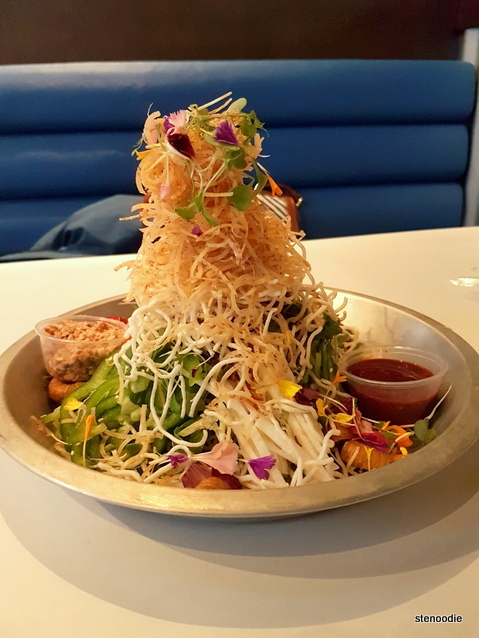 When Ken and I dined there for a late dinner after a movie at the nearby Cineplex, we used our $20 gift certificate to order the Good Catch Slaw and the Honey Garlic Chicken Wings (which came with fries). On this visit, the restaurant was live and full of energy since the hockey game was on and the Leafs were winning (yay). It was the epitome of a great sports bar to be at due to the many flat screen TVs around the restaurant showing the game with wings and beer on tap too. The service on this visit was so-so. I personally thought that our server wasn’t very friendly and just did her job for the sake of it. When we wanted to reach her to get the bill at the end of the night, she had left the restaurant for a five-minute break so we had to wait until she returned before we got our bill sorted out. The Good Catch Slaw was as good as I had it at the media tasting. I think this slaw is such a great item to have on their menu for those who want something light and not order another meat or seafood dish. I chose the chicken wings to share since I had absolutely loved them during the media tasting event. Their chicken wings were so large and juicy last time. 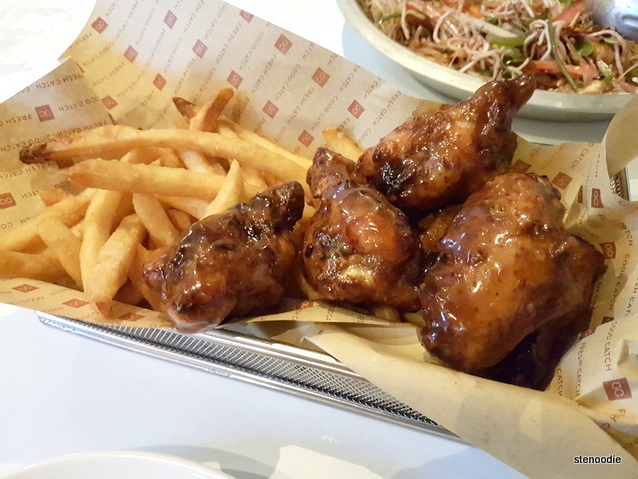 This time, the Honey Garlic Chicken Wings were just as large and juicy; however, I thought that they were much saltier than when I had them at the media event. Both items filled us up and we didn’t even finish all of the fries since what we ordered was a lot of food for the two of us. Buckets on the side of the table are a new addition since I last came here! We arrived at the restaurant a little after 5:30 p.m. and I was surprised to see that there were already a good number of tables dining in. I was surprised since it was early yet there were people already in the middle of their dinners. 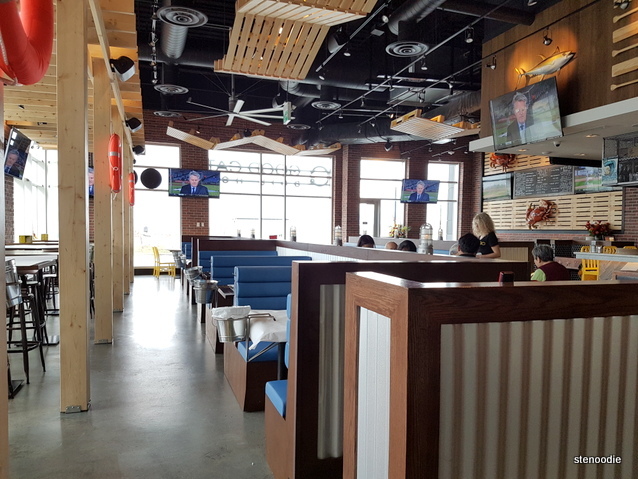 It really proved to me that Good Catch Boil House has a lot of staying power in Markham and is already very popular among the community. 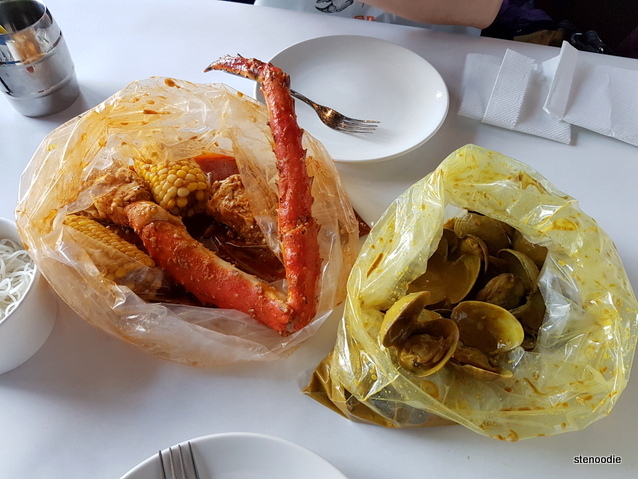 Anyway, on this visit, since we had $50 to spend, we ordered one pound of the King Crab Legs and one pound of the clams to try. The King Crab Legs were in Cajun Sauce while the clams came in Curry Sauce. We also ordered one portion of vermicelli and two corns to go with our seafood boil meal. Our food arrived very quickly to our table. 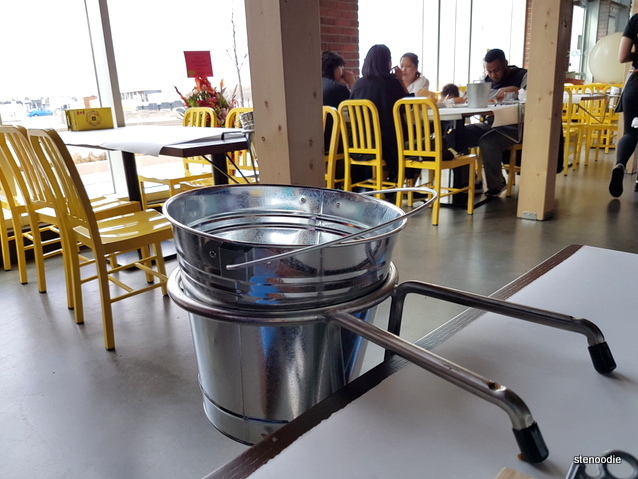 😀 This time, there was also a metal bucket attached to the side of our table for easy disposal of the seafood shells. The Curry Sauce was just as spicy and rich as the first time I had it during the media event. This sauce went so well with the plain vermicelli (which arrived in a container separately for $2 — I didn’t take a photo of it unfortunately). The vermicelli came super hot and my mom really liked it. The clams had almost all fallen out of their shells which meant that perhaps this had been a little overcooked. 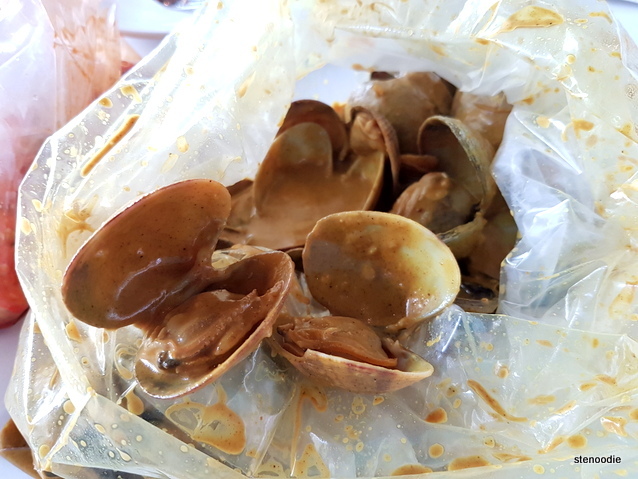 However, I still really enjoyed the meaty clams and the curry sauce. The curry sauce was spicy and had a good heat to it. The King Crab Legs in Cajun Sauce were largely portioned and full of meat. 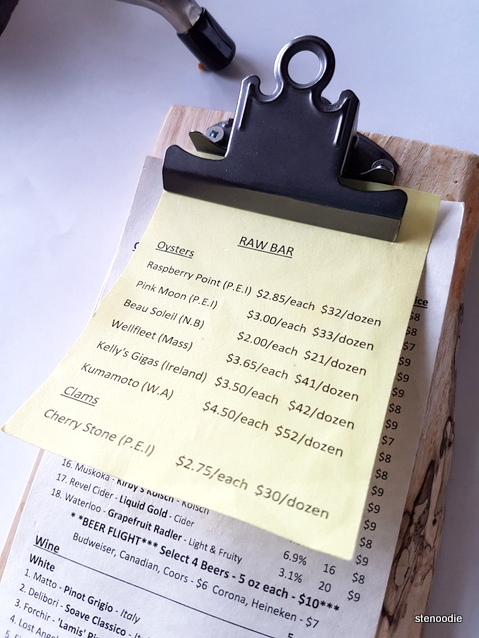 However, I thought that they weren’t as fresh as they could potentially be… I’ve been to a competitor’s seafood boil restaurant and the king crab legs there were SO much better! 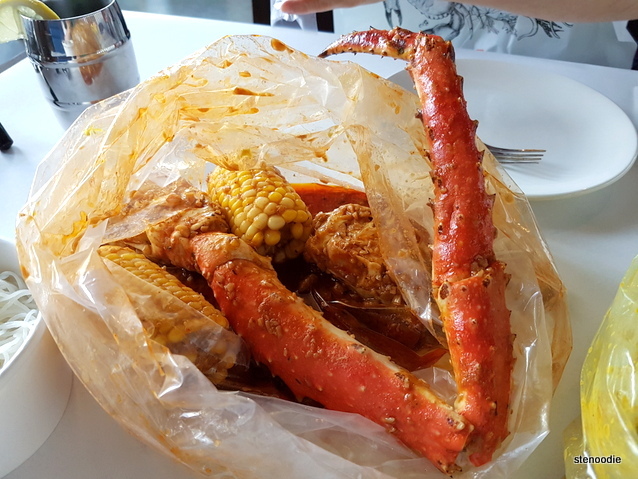 (And that competitor is Captain’s Boil :P.) I thought that the king crab legs here at Good Catch Boil House were very meaty but could have been more fresh and juicy. The meat in these crab legs tasted more coarse and weren’t juicy — there was no juice dripping out of the shells as we pulled it apart (juice is usually a sign of freshness for seafood). The Cajun sauce was absolutely delicious though and I ensured that no sauce escaped my fingers. XD It also wasn’t very spicy for those of you who are wondering. The corn cobs inside the bag were also very fresh, sweet, and juicy. I loved the corn cobs. Despite the slight highs and lows of dining at Good Catch Boil House, I know I will be back again for more. Their food really is delicious! Next time, I want to try their Oyster Sliders again as well as their Lobster Rolls and maybe Lobster Nachos. 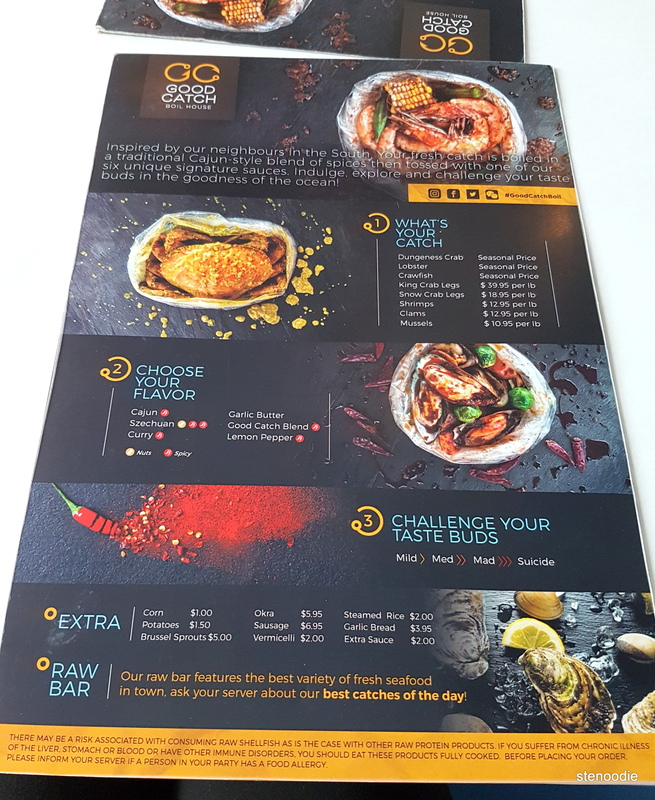 🙂 Even my mom was impressed with the variety of hot and cold dishes that they serve here; it’s not just a seafood boil restaurant which caters to more customers and has a more well-rounded menu. This entry was posted in Food and tagged 179 Enterprise Blvd Unit M-109, @GoodCatchBoil twitter, Clams in Curry Sauce, food blog, foodie, free wifi, Good Catch Boil House, Good Catch Boil House menu and prices, Good Catch Boil House Raw Bar menu, Good Catch Boil House Seafood Boil menu, Good Catch Slaw, Honey Garlic Chicken Wings, Honey Garlic Fried Wings Basket, King Crab Legs in Cajun Sauce, Markham, Raw Bar menu, restaurant review, seafood boil restaurants, Toronto. Bookmark the permalink.